Falsettos, William Finn’s musical originally on Broadway in the 90s, tells the story of a family reconfigured by the coming out of a homosexual father during the AIDS epidemic. 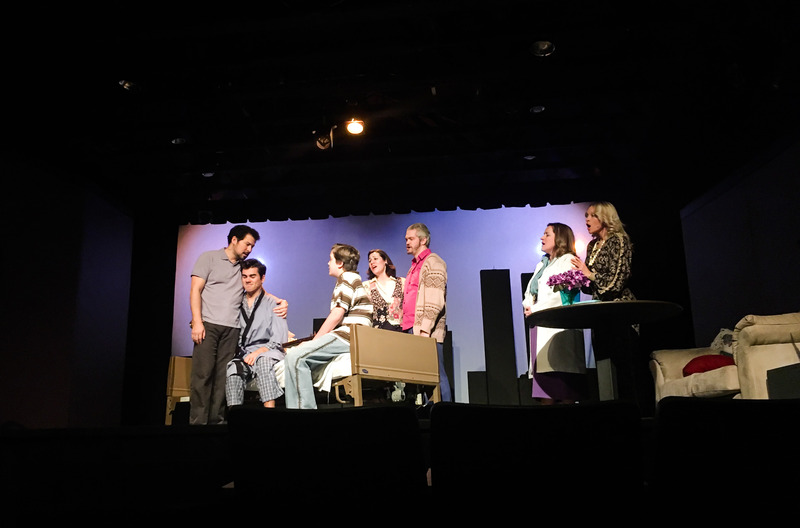 Set in the late 70s and 80s, Falsettos follows the life of a family of three; Trina (played by Alyssa Hersey), Marvin (played by Brandon Michael) and Jason, the son, (played by Aiden Headley), as they evolve after realizing that Marvin is gay and sleeping with his new love Whizzer (played by Duncan Menzies). The family navigates divorce and the remarriage of Trina to the family’s psychiatrist, Mendel (played by Kyle Ross), while concurrently planning Jason’s bar mitzvah. The relationships portrayed between all these characters create opportunities for any viewer to relate. From the comedic, hot-and-cold love story between Marvin and Whizzer to the Jason’s angsty, coming of age story that starts as a life soley lived for chess and quickly changes to a life lived for one thing only; girls. Beyond the dynamic relationships portrayed in the musical, the cast masters the musical numbers in tone and in mood, which, as a layman, appear notably difficult. “Trina’s Song”, which depicts Trina, newly divorced, coming to grips with her new situation. As Alyssa sings, “The only thing that’s breaking up is my family. But me, I’m breaking down,” she masterfully depicts here moment; seesawing between a happy appearance for her son and the reality of her despair. Martin’s character conveys such authentic emotion in his duos throughout the play with Whizzer and Jason. That addition of Charlotte (played by Callie McKinney Cabe) and Cordelia (played by Amy D’Orazi) in the second act adds some needed playfulness as the reality of AIDS takes hold of the family. While the characters deal with their changing realities and the AIDS epidemic takes shape, the lyrics to many of the songs still feel so timely. It’s almost as if Finn wrote this play anticipating the cultural shifts to come. Comprised of a petite cast, Falsettos show us to find acceptance in our changing family structures.. Although not abundantly clear or outspokenly loud, the cultural changes of love and acceptance wiggled their way to North Idaho. And as Marvin so eloquently puts it in his song to his love Whizzer, “Can you tell I have been revised? It’s so swell, damn it, even I’m surprised. We laugh, we fumble, we take it day by day. What more can I say?” Acceptance is upon us and we are definitely stumbling towards it. Is there a better thing to stagger towards? Falsettos is a nice reminder of how far we’ve come. We hope you all will support your local theatre! It takes the community to make theatre possible!